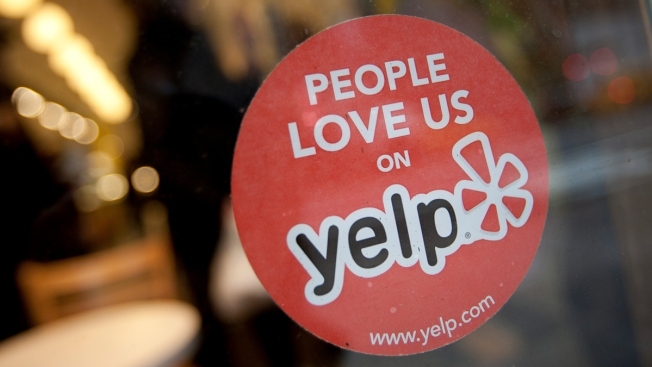 The Yelp Inc. logo is displayed in the window of a restaurant in New York, on Thursday, March 1, 2012. A Florida veterinarian has sued for defamation after a dog owner posted a harsh review of his clinic on Yelp. Dr. Thomas MacPhail said he filed the lawsuit because the dog owner had smeared his clinic in DeLand, Fla., located halfway between Orlando and Daytona Beach. The dog owner, Thomas Lloyd, complained about the DeLand Animal Hospital in a Yelp review after he took his ill standard poodle, Rembrandt, there last March. In the original review, Lloyd said he took Rembrandt to the vet and that the staff initially took him in. Advising the standard poodle likely suffered from a ruptured spleen, staff said Rembrandt needed emergency surgery costing about $1,800. Lloyd wrote that he paid the money immediately. He asked if they would treat Rembrandt right away and staff said they would, he wrote. Six hours later, the staff called Lloyd and requested he take Rembrandt to another veterinarian because they could not find a surgeon, Lloyd wrote. "The staff had wasted six (6) hours of Rembrandt's life and destroyed whatever chance he may have had to live. When I took him in, he could not walk and had a very hard time breathing. When I picked him up, he was beyond hope, so I took him to another veterinarian, and they him put down," Lloyd wrote. "Our Rembrandt deserved a better last day." The Daytona Beach News-Journal reported that staff at the clinic had told Lloyd that Rembrandt required surgery. However, they said staff concluded that the dog wasn't stable enough for surgery and discharged the poodle. Lloyd took Rembrandt to another clinic where the dog was euthanized. MacPhail's attorney said the legal fight would end if Lloyd took down the review. Lloyd updated his review in July, calling being sued "horrible" and an "emotionally and physically draining experience."